Shelley Crombie admitted a charge of careless driving and failing to stop at Aberdeen Sheriff Court. A sheriff yesterday blasted a “callous” driver for failing to help a woman who was struck by her car along with a pram. Distracted Shelley Crombie hit Emma Brown with her vehicle while driving out of a Burger King car park. But she panicked and left the scene instead of stopping to help the casualty and her baby. The injured woman was signed off work for four weeks and needed physiotherapy sessions because she had suffered tissue damage. Crombie admitted a charge of careless driving and failing to stop at the scene of an accident on May 15 last year when she appeared at court yesterday. 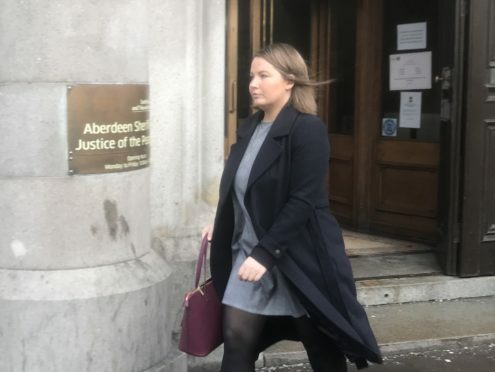 The court heard she had driven straight out of the Queens Link Leisure Park in Aberdeen because she did not like confrontations. Representing Crombie, defence lawyer Gregor Kelly revealed that his client had been going through a stressful divorce at the time of the offence. He said: “She is 35-years-old and employed as a sales consultant with a housing group. “On May 15 she received a particularly aggressive letter from her husband’s solicitors regarding payment of maintenance. “She avoids confrontation if she can. “She accepts she was distracted. But Sheriff Graeme Buchanan took exception to this, and said that her circumstances at the time did not excuse her actions. He went on to say to Crombie: “This is about as bad a case of failing to stop as you can imagine, other than those who who fail to stop to be breathalysed. He fined Crombie, of Kirkhill Road, Potterton, £600 and banned her from the roads for nine months.